As the owner of Ducktoes Computer Services, I want to do the best computer repair we know how to do. Fortunately, I have awesome skilled techs who share this vision. I have hired the most experienced, honest, friendly techs that have come to Ducktoes with a wide variety of skills. Others have come and learned on the job. Really, they are awesome. Virus removal techs who can remove almost any virus without reformatting. Data recovery techs who can recover data and photos from dying hard drives. Software techs who can find the most obscure and difficult drivers on the internet and fix corrupted profiles and operating systems. Hardware troubleshooting techs who can diagnose the trickiest, most difficult hardware problems and find solutions that work and are cost-effective. Laptop techs who can solder jacks onto motherboards, change out screens and keyboards, fix broken hinges and bezels. Hardware techs who can build high-quality, fast, and reliable custom desktops. I also have techs who want to do even better. They want to do the highest-calibre computer repair possible and make sure every computer we fix is going out in the best shape possible. That’s partly what I mean when I say they share my vision. Ducktoes Techs have instituted quality computer checks. To that end we’ve instituted quality checks. I tried to start this several times before but then the shop got too busy and we weren’t able to keep it up for more than a couple of days. This time the idea has come from a couple of techs themselves. Together we’re determined. We’ve made a checking station upstairs and every laptop and desktop must be checked to see if the repair was effective with all known issues resolved. It should also work well and be as fast as possible for its age and condition. Now we also have a form to fill-out to check off the most basic and important components and performance to make sure no problem slips by unnoticed. 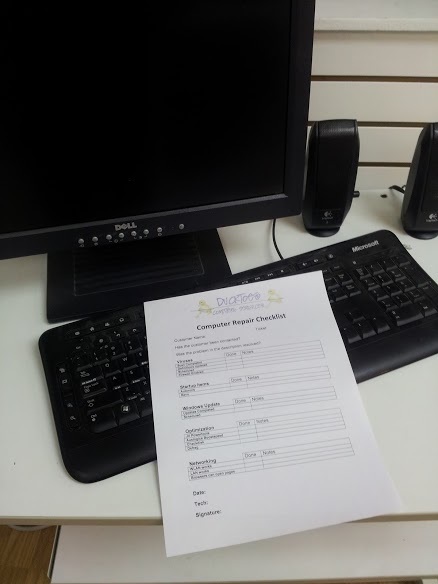 Come and see our quality check station and form for yourself. Come and try out our repair services.